Calico cat happened as a giant collaborative piece where hundreds of members of the community got involved. It was made with the intention of accompanying the sculpture “Roy”, but the object of the piece was to create a patio which would also double as a perfect band shell. It has been engineered to have perfect acoustics for bands to play under it, just as a normal band shell would. 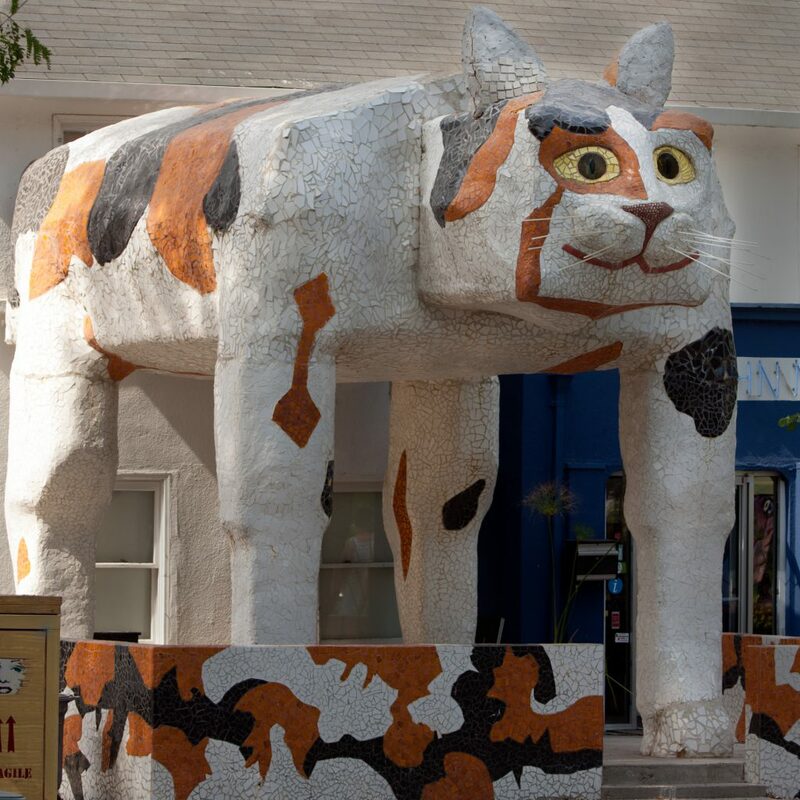 Also, there were several other intentions; John Natsoulas wanted to pay tribute to Joan Brown who had done several cat benches at the Arden Fair mall in Sacramento that were destroyed and removed. The cat was a big part of all her bodies of work whereas, collaborator Steve Souza wanted to pay tribute to his own calico cat. Other members of the sculpture team, Judd Takai and Tait Takai were the primary leaders in building the patio and cat, who were essential to the entire process. The engineer on the cat was Bill Larson and the interior armature fabricator was Amanda Larson who guided the direction of the cat. Other community members that helped on the early parts of the patio were artists Wes Horn and Mark Rivera. The project would not have been possible without a huge number of volunteers and a huge thank you to Davis High School students from Lynette Diem and Doug Wright’s classes.